We are celebrating National Surveying Week March 17-23, 2019. 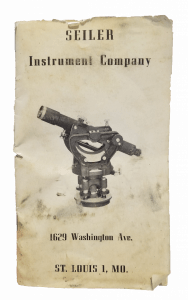 Seiler Instrument / Seiler Geospatial is part of this important history as a St. Louis Maker of Surveying Instruments. Did you know that Seiler Instrument/Seiler Geospatial, played an important role in surveying history as one of the original makers of surveying instruments from the St. Louis area? Read more about Eric H. Seiler and several others that contributed to the rich history of surveying and the master craftsmen behind these handmade instruments. Note: The story on Seiler in this article is being updated, so check back soon for updates. Also, we thank the authors; Hugh A. Parsons, PS and Richard L. Elgin, PhD, PS, PE. The article is called; The St. Louis Makers of Surveying Instruments Since 1830.